When I think of the name ‘Glenturret’ I visualise a single turret of a ruined castle breaking through the highland mist, overlooking a loch, bearing the scars of previous battles dating back to the time of Robert the Bruce. You can tell that I’ve never visited the Glenturret distillery or my dream would be shattered. It’s nothing like that, unfortunately. As it is, Glenturret is the home of the Famous Grouse Experience, which must keep the place pretty busy. Founded in 1775, it has a strong claim to being Scotland’s oldest distillery. That always amuses me because it’s not like the whisky produced today dates back to the time the distillery was founded. And it’s not like the staffs’ experience dates back that far either. I know whisky is meant to be the water of life but I think it would be stretching it to have a stillman as old as Glenturret itself. The Glenturret ‘Triple Wood’ is supposed to be exclusive to The Whisky Shop in the UK but it’s perfectly possible to purchase it abroad. The shop I’ve used in Holland has it in stock. Nevertheless, it’s nice to get something that’s not readily available everywhere. 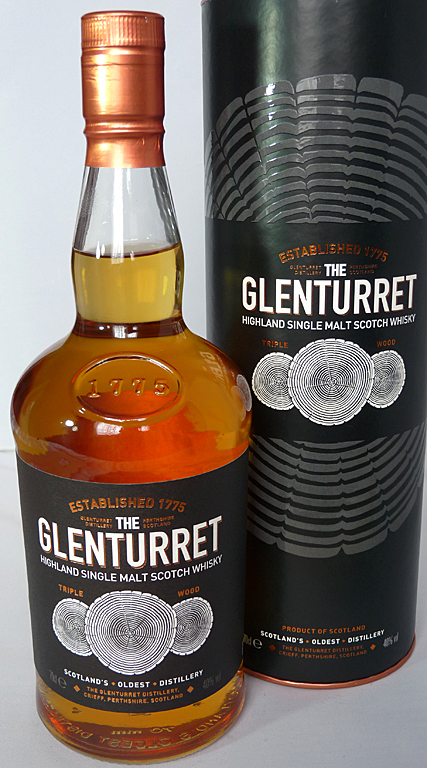 Glenturret appear to be branching out because I’m seeing more and more new offerings from the distillery, once famous for 1 or 2 releases and that was your lot. Everything else went into blended whisky. Thankfully they’ve seen sense because I’ve always liked the house style of Glenturret. I still have a small amount of the classic 8-year-old, and the 10-year-old is begging to be opened. This entry was posted in Glenturret and tagged 40%, 70cl, Glenturret, Highland, Highlands, NAS, Single Malt, The Whisky Shop, Triple Wood. Bookmark the permalink.